Poppies Fabric is a quilting store in Washington state. During the summer of 2001, they decided to have a Challenge Quilt Contest which would feature RJR's new fabric line, "Stained Glass". The only hard-and-fast rule was that the quilt needed to be larger than 24"x24" and needed to showcase the Stained Glass fabric line, though you weren't limited to only that fabric. A customer of Poppies was a fellow participant on About.com's Quilting Forum and she posted a message telling everyone about the Challenge. To enter the challenge, you needed to buy a Challenge packet from Poppies, in which would be a selection of fabrics from the Stained Glass line. Although I had heard of various Challenges before (notably the well-known Hoffman Challenge), they had always intimidated me because they were on such a grand scale. This Challenge seemed a little more manageable and personal for me. So, I took the plunge. Since this wasn't a big show, there was no lucrative prize involved .. if memory serves me correctly, the winner receives a $100 gift certificate to Poppies Fabrics. But more importantly to me would be the peer recognition of a job well-done. However, before I actually got the packet in my hot little hands, I put on my thinking cap and began to ponder what sort of design would best show off the Challenge fabric. I didn't want to do a stained glass quilt for two reasons: 1) I've done 6 Christmas stockings and 1 tree skirt using that technique so I didn't feel constrained to do another one and 2) I figured that would be the most obvious technique that others would choose. If one is entering a competition, it is better to have a unique design, so that it stands out from the other entries. Failing that, if your entry is similar to that of others, your technique and workmanship had better be extraordinary in order to be noticed. So, as I waited for my entry packet of fat quarters to arrive, I started looking in my reference library for designs. I came across a printout of a website and also here that had an intriguing sashing called, Garden Maze. I thought that if I had some interesting blocks to put inside the Garden Maze setting, this might be a winning design layout. I knew that the challenge packet contained only Fat Quarters and I did not want to experiment using them, so I decided to make a mock-up of the pattern I chose, to see if 1) I liked making it and 2) to make any mistakes on the mock-up rather than with the challenge packet materials. For this test run, I simply used some colorful tropical fishy fabric that I had in my stash. 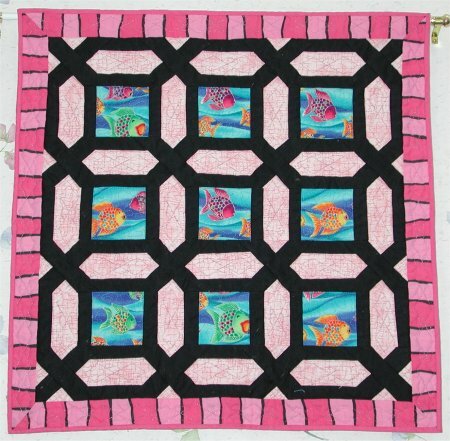 The quilting was done with Superior's metallic thread. Remember, this mini-quilt was just a mock-up, a practice run for me to see how the Garden Maze sashing was made. For the next phase of my competition entry, click on the "next" button below.